Who can resist the big, bodacious flowers of the hydrangea? Just be sure to plant those types that will succeed in our cold climate. I get lots of questions from gardeners in Iowa asking why their blue hydrangeas aren't blooming. The sad answer: It's too cold for them here. Mop-head hydrangea (Hydrangea macrophylla), also called big leaf or French hydrangea, is gorgeous when well-suited to the climate and the soil. It has nice, big green leaves and puff-like balls about the size of melons. Especially in the moist, highly acid soils of the East Coast, they are a stunning blue. In less acidic soils the flowers are pink. Here in the Hawkeye State this type of hydrangea will grow healthy, attractive foliage, but our Iowa late spring frosts zap the developing flowers (the same thing happens to most peach trees). Some Iowa gardeners, if they're lucky, get a few puny mauve-colored flowers now and again. But a non-developing flower is a non-developing flower. Adding sulfur or other elements to the soil will not make a flower develop in Iowa. The good news is, however, that there is a new type of hydrangea, 'Endless Summer', bred in Minnesota, that has promise for Iowa. But this plant was very recently put on the market and I feel the jury is still out: I have one and it's struggled a bit. I've yet to see a big, blue gorgeous hydrangea growing in Iowa. More good news: There are some hydrangeas that do really well in Iowa and are very pretty. 'Annabelle' hydrangea grows 3 to 5 feet tall and gets large creamy flowers also the size of melons. The flowers will dry right on the plant (or in a vase) to a pretty buff color and last for months. 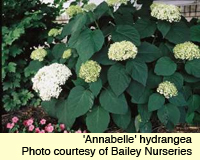 Annabelle is one of the smooth hydrangeas (Hydrangea arborescens). Like all hydrangeas, it likes moist soil. It will do well in light shade, but also in full sun. Also experiment with the panicle hydrangea (Hydrangea paniculata). It has large, cone-shaped creamy white flowers that last a long time, also. It will reach as high as 10 feet. Try 'Grandiflora' or 'PeeGee', two of the most popular cultivars. 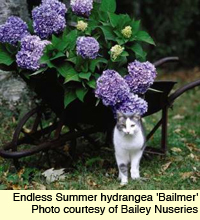 There's a lot of confusion about pruning hydrangeas, but you have to be careful with the timing only in warmer climates. 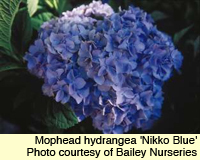 If you do have a mophead hydrangea, prune it as little as possible in our climate. In late May, after its leafed out, if there's any dead stuff, trim it out and be done with it. With other hydrangeas, cut out any obviously dead wood in late April or early May, when the stems are leafing out. Otherwise, cut them back--only as needed--in July or so after they're done blooming.